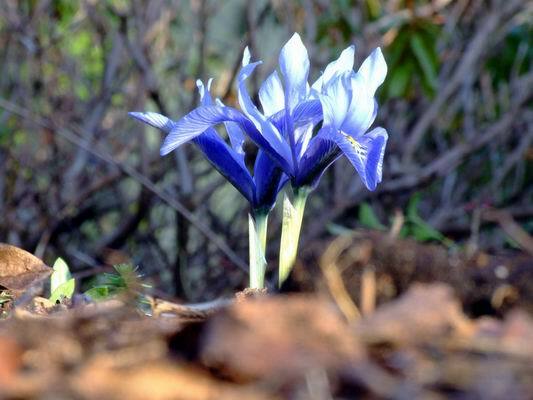 I remember when Iris histrioides major was common place and everyone had quantities of it, then in the course of a few years, it practically disappeared. How pleased I was to receive a tiny bulb on one of my last visits to the late Eric Watson's garden; it took a year or so to flower and now there are two flowers - I do hope that we can keep it going. This is sadly the case with many plants, not just bulbs, one year there are masses then something happens, be it a disease or climatic conditions and it is gone from our gardens. This is a good warning to us not to take for granted plants that appear to be common place - if you do not pay them proper attention they could be lost to cultivation. 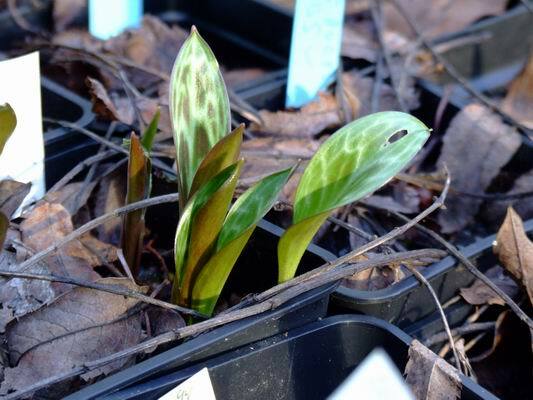 The leaves of Erythronium multiscapoideum have been showing for some weeks and now others are appearing in the frames. The chewed holes in these fresh greens reminds me to get some slug pellets down soon. 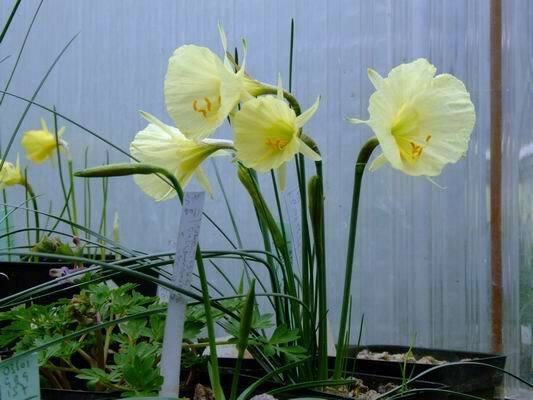 Back under glass I am pleased with my hybrid between Narcissus bulbicodium and N. romieuxii. As you can see from the picture it is intermediate between its two parents and I think it is a promising plant - I just have to wait and see if it will increase well and early indications suggest that it will. It has a very big flower 4cms wide by 5.5cm long on a relatively short (10cm) flower stem. The short stem is always one of the features that I try and select for in the winter flowering narcissus as they do have a tendency to etiolate in our poor light levels, so, the shorter it is to start with the better. 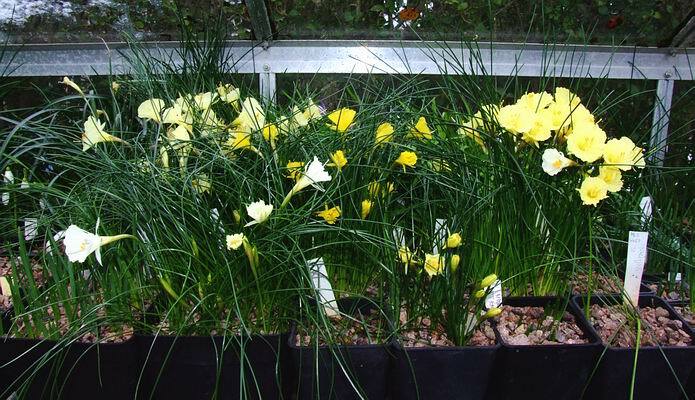 Here is a group of mostly Narcissus romieuxii forms showing the variation in flower colour as well as the long stems that they develop as a result of low light and of course, it is not helped by the way I grow them so tightly packed together. Notice in the foreground the third pot from the right has a very short form (5cm high) just starting to open. I will show it later when it is in full bloom but this is the shortest form of romieuxii I have ever raised. It is in a pot of mixed bulb seedlings lifted from the sand plunge two years ago and it contains mostly N rupicola plus this short romieuxii, I must clone it out this year. 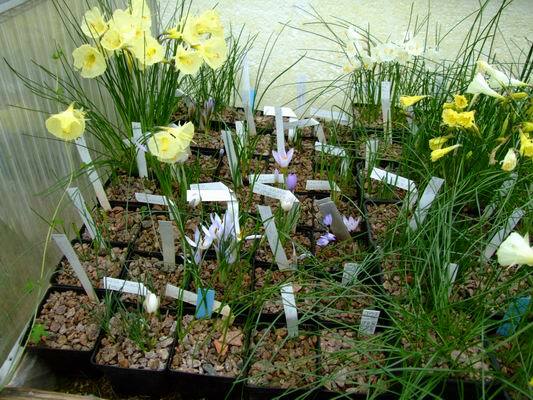 Another view with 7, 8 & 9 cm pots of crocus and narcissus. I have no regrets in my decision to change over to plastic pots and also to keep the size down so I could fit more in. 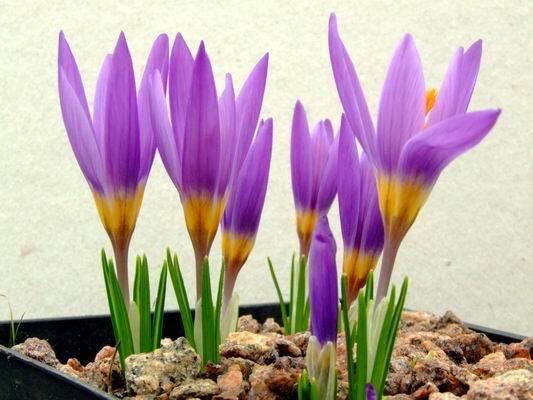 A well flowered 9 cm pot of Crocus abantensis is all you need to appreciate the species - in many ways a single crocus flower in a 7cm pot is simple perfection. 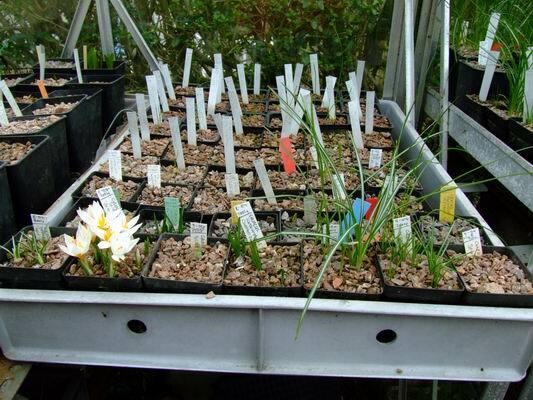 However I do also like propagating bulbs so will always tend to pack my pots with as many bulbs as I can get in them even if it means that the flowers overlap each other when they open in milder sunny conditions. 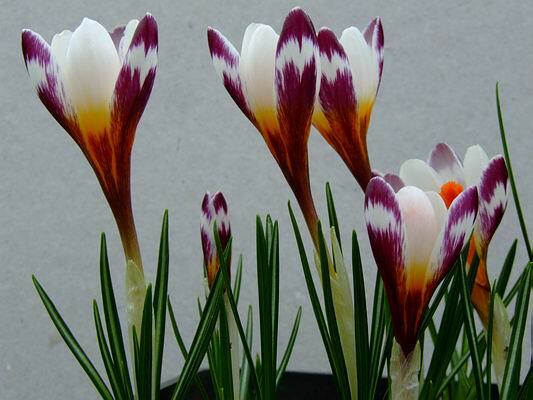 I think that this form of Crocuc sieberi ssp. sieberi is among the most dramatic colour variants that I have seen. It was given to us by another of the great names in the alpine plant world, the late Harold Esslemont. For years I struggled to please this form, it was one step forward when I thought I had cracked its cultivation then and two steps back as I was reminded never to become nonchalant when looking after your plants. 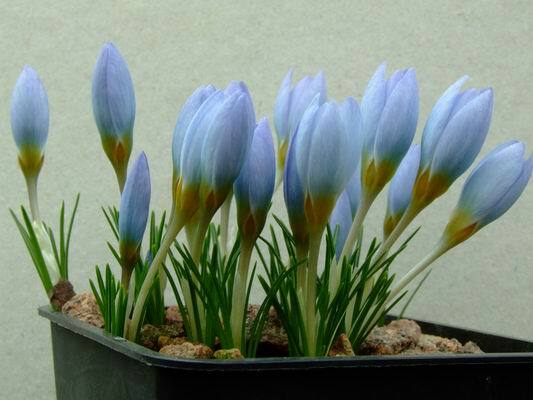 Crocus sieberi ssp. nivalis is quite a short form and offers no problems in cultivation as it is steadily increasing and next year I will try some outside in a trough or a raised bed. Last year I cobbled together this extension tray in the Gothenburg annex and it can hold up to 63 7 cm pots - as you can see it is full already with pots of crocus seedlings. 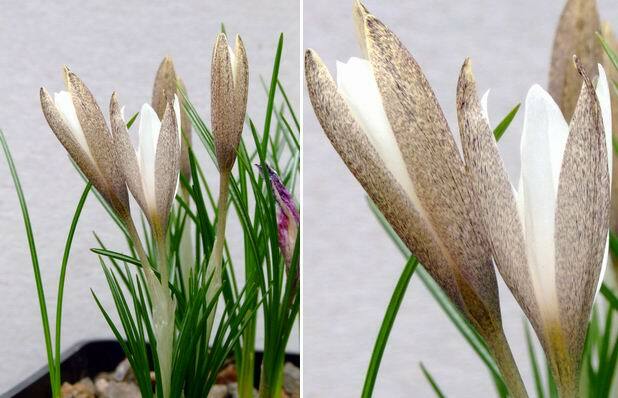 This form of Crocus alatavicus came from Janis Ruksans and is increasing well vegetatively, however the petals are a bit narrow and it has not set seed for us yet. How often is it the case that the best increasers do not have the best flowers - the other form we raised from Gothenburg seed has beautiful full flowers but it has not made any offsets- it however does set good seed. I have, of course, been cross fertilising the two forms in the hope of combining their best features to give me the perfect plant. 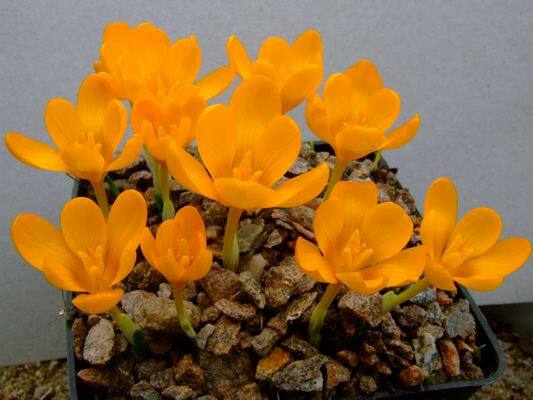 We have no trouble increasing Crocus gargaricus which spreads well in the garden making great patches of the egg yolk yellow flowers - I only wish I could get eggs with yolks that colour nowadays. 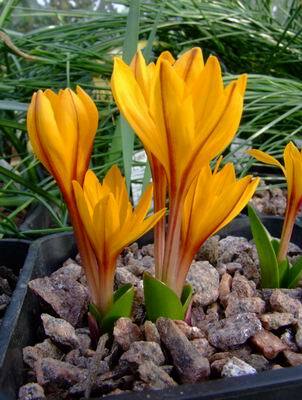 A similar colour to my Colchicum luteum x kesselringii that is now fully out and looking good.